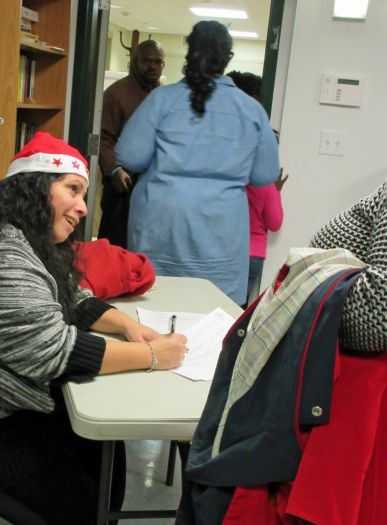 Stamford, CT - Holiday elves from Backyard Humanitarian, Build On and New Neighborhoods, Inc. (NNI) made the season a little brighter and a lot warmer for many tenants from NNI properties by turning the Activity Room into a Winter Coat Closet distribution center for a night. At the end of the evening, 290 coats had been snapped up by tenants from NNI’s Martin Luther King Jr. Apartments, Marshall Commons, Madison Smith, Belltown Manor, the Atlantic, Stillwater Heights and Friendship House in Stamford and Fair Street in Norwalk. Teen volunteers from Build On helped sort the men’s, women’s, and children’s coats and jackets collected by Backyard Humanitarian, and kept the tables and racks replenished. NNI Tenant Advocate Program Coordinators and Property Managers assisted tenants with fitting and selection. 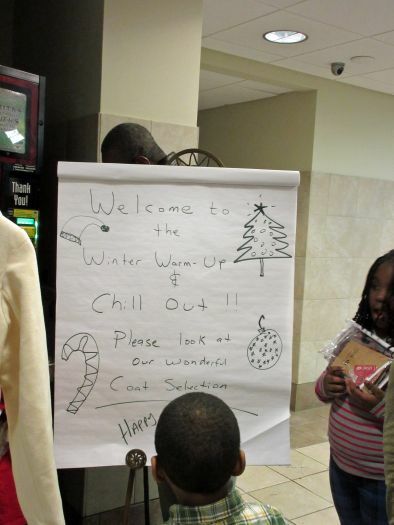 The Winter Coat closet was part of a Holiday Warm Up & Chill Out gathering organized by NNI’s Tenant Advocate Program (TAP) coordinators for tenants at all of its properties. Before and after coat ‘shopping,’ guests stepped across to the Community Room for chili and cocoa, holiday crafts, storytelling by Laconia Therrio, clowning and magic by Sox, a drawing for Gift Baskets, ComeForCare cooking demonstration, and activities and literature from HSBC. NNI, which will celebrate its 50th birthday in 2017, is Fairfield County’s oldest active nonprofit developer, preserver, and manager of quality affordable ownership and rental housing.